Only 7 pcs in stock, hurry! To see how they experience it ! A: Orders ship within 24 hours. We offer Express shipping ( free shipping ) which takes 2-4 bus days ( 2-4 Bdays in USA, others is 3-5 days ). The Express Shipping includes DHL and Fedex. And you can receive a notification after shipped out. NOTE: PO.Box is not accepted. Don't use a PO.Box as your shipping address. Otherwise the package can not be delivered. And, you need to add your phone number when you file the shipping info. 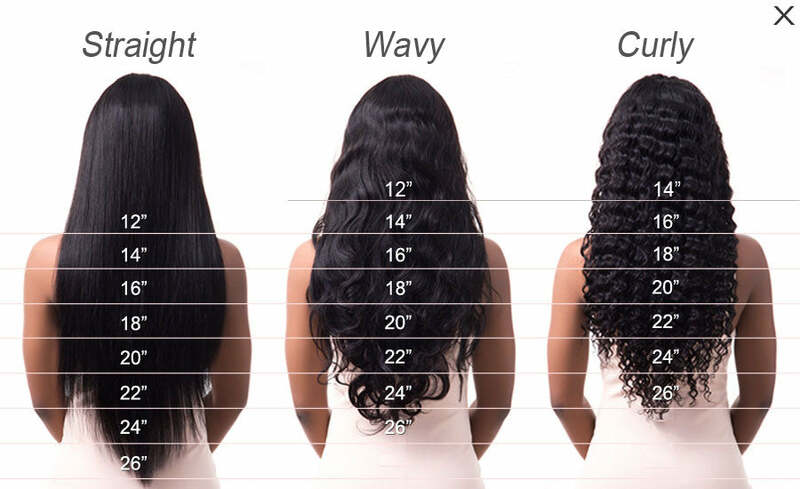 A: We only have the color #1b( natural black ) in stock, if you want other colors, you can send us an email: stella@luvmehair.com , And you'd better provide a pic of the color you want. Normally, we provide coloring service for some colors. 1, Use good shampoo and hair conditioner to care the hair. It’s important to keep the hair soft and shiny. , if not, it will be charged a processing fee. A: Usually you do not need to pay taxes, but if your country's customs is more stringent, you will be charged a certain amount of duties. We usually try to avoid tariffs for you as a low-declared invoice with parcels, however, it is not 100%. You will need to pay the duties if the custom still charges customs duties. Germany, Italy, South Africa, almost all South American countries, UK( occasionally ), Canada( occasionally ). When you wash the hair, better to brush it first. Use warm water and hair shampoo to wash for twice. Then put hair conditioner equally on the hair for 5 minutes. Then wash it with cleaning water. Hair conditioner is very necessary every time when you wash your hair! We suggest you to use high quality hair conditioner. If you want to blow your hair dry, please blow to 80% dry, then keep the rest 20% to naturally dry, by this way, it will keep your hair away from drying and frizzy! When you feel the hair is very dry, you can spray some hair oil. Meanwhile, when you wash the hair, you can pour little hair care oil into warm water ,and put the hair inside that warm water for 10 minutes around. The hair will be more silk and soft comparing before. But we don’t suggest you to use hair oil everyday. Because hair oil may make your hair strands dry and hard! If you want to get your hair curls back, better to use crimping iron to curl the hair according to its original curl shape again! If you want your wig/hair looks natural/amazing as our post on FB/IG, you have better to book a professional hairstylist to install it. If the hair is wavy or curly style, we don't suggest to comb it. If you have to, please comb it with hands or wide-teeth brush gently. Tight teeth brush will ruin the hair original shape and make it fizzy and feels like tangle! Please always comb the hair from the ends and work your way up. When you dye the hair with bleach powder, please control the time within 5 minutes. If you dye it with dye cream, you need to control the time within 20 minutes. Otherwise, the hair will be damaged by cream if you leave it too long there. When sleeping,please bond the hair with elastic band or wear a cap. It will avoid tangling or shapes-changing. After waking up, please remove the band and comb through beginning at the ends and working your way up to the roots. When swimming, we suggest to wear a swimming cap. Because the sea water or pool water is not good for hair, it will make the hair tangle and rough. It’s better to wash it with warm water, with hair shampoo and hair conditioner after swimming. For more hair care/usage tips, you can read our hair blogs or follow us @Luvmehair on Youtube / Facebook, we will often post tutorial videos about hair care and hair usage there!